The Sports Archives – Nine Terrible Football (Soccer) Tackles That Ended Careers! Football – the beautiful game (sometimes at least). Football is a game full of passion and aggression, however, being a contact sport, injuries occur and are generally accepted as part of the game. For a few unfortunate players though, some of these injuries are inflicted in nasty circumstances by vicious tackles that prematurely end footballing careers. Here are nine of the unfortunate ones. Joining Manchester United at the tender young age of nine, Ben Collett was a left-footed, hard-working player who was gifted at reading the game. Ben had an amazing career ahead of him but fate (and Middlesbrough’s Gary Smith) had other ideas. During his first game for the reserves in 2003, Smith savagely came in high and over the ball collecting Collett and his leg was fractured in two places, the tibia and fibula of his right leg. Although Collett returned to training in 2004, after months of physio treatment, he was never able to reach his previously high level of play before injury, and was forced into early retirement. He was awarded £4.3m in damages including £3,854,328 for predicted loss of earnings. In 1998, Matty Holmes’ career was finished after a nasty challenge by Kevin Muscat while playing for Charlton in a fourth round FA Cup replay against Wolves. In a six-year battle for compensation by Holmes against Muscat, Holmes was finally awarded damages of £250,000 plus costs with the overall figure around £750,000. Muscat has been described as a ‘dirty player’ with a long history of inflicting career threatening injuries on his fellow opposition and examples of this and Muscat’s disciplinary record were shown in the high court. Whether or not the challenge was deliberately meant to hurt Holmes, his injury was so severe that his surgeon stated he was lucky not to have had his leg amputated! It took several operations to repair his leg, but he has never been able to return to football. Former West Ham striker Dean Ashton was forced to retire in 2009 after shattering his ankle in a heavy tackle with Shaun Wright-Phillips during training for the England squad in 2006. Even more unfortunate for Ashton was the fact that it was the day before he was due to make his England debut. He returned after 11 months to continue playing and earned his only England cap in June 2008. 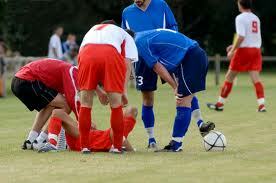 Nevertheless, he failed to completely recover and continued to have problems with his ankle. Three years later he was forced to retire aged 26, after being warned he should stop playing football or he may end up not being able to walk properly. Ashton received an undisclosed sum from the FA in a private compensation claim. The 28-year-old Bradford City striker Gordon Watson was awarded £909,143 for loss of earnings – the highest to date so far – when he suffered a double fracture of his right leg. The dangerous tackle during a match on February 1, 1997, saw the Huddersfield Town player Kevin Gray recklessly jump in with both feet from a considerable distance. It was initially thought Watson would never play again, but after five operations and 18 months out he returned to the football field. He never played another full 90 minutes for Bradford City and subsequently declined contract renewal at the end of 1998-99 season as he felt he wasn’t able to able to play in the top flight anymore. Described by some as the worst football injury ever seen, David Busst was injured two minutes into a match at Old Trafford in April 1996 as the ex-Coventry defender collided with Manchester United player Denis Irwin – resulting in a double compound fracture (the tibia and fibula snapped in two), and caused the cracked fibula bone to pierce the skin. The shock and reaction from Manchester United’s Peter Schmeichel showed just how ghastly the injury was, as Busst also underwent several weeks of counseling to help him deal with the sickening sight. The game was delayed for 15 minutes while the blood was cleaned off the pitch! The injuries were so bad he required 26 operations to repair the extensive damage and he never played professionally again. April 2001, four years after Alf-Inge Håland criticised Manchester United’s Roy Keane for faking injury, Keane dealt out his own form of revenge by way of a crippling studs-up tackle on Håland’s right knee – seriously damaging knee ligaments in the process. Keane was red carded and initially fined £5,000 and also handed a three-match ban; however, a year later upon admission in his biography that he’d deliberately set out to hurt Håland, he was banned for a further five matches and fined £150,000. The former Leeds player ended up retiring in 2003 after implying that the tackle had finished his career and he has never played a full game since. After representing his country 56 times and scoring 10 goals, Luc Nilis had his footballing career with new club Aston Villa cut short in the 2000-2001 season after an ugly clash with Ipswich Town goalkeeper Richard Wright. As he was about to shoot, the goalie came out to stop him when they both collided, Nilis was stretchered off and taken straight to hospital with a double leg fracture. After two operations, Nilis was forced to quit the game and retired. Within weeks of the start of the 1992-93 season during a match at Anfield, the popular Chelsea defender Paul Elliott made a bad decision and threw himself into a challenge from behind on Liverpool’s Dean Saunders. Anticipating the tackle, Saunders spitefully sent his studs flying into Elliot’s right knee, creating a five-inch gash and causing terrible ligament damage. Despite three operations and fighting for eighteen months to make a recovery, Elliot was forced to declare his retirement. Elliot proceeded to sue Saunders over his reckless tackle, yet lost his case when Saunders was found not guilty. I felt obliged to add this rather sad story. On Christmas Day in 1909, a bizarre on-field accident resulted in the death of this Hibernian and Scottish international defender. The Firhill pitch at Partick Thistle was icy and hazardous. Ironically, Main was overheard saying to Hibernian’s trainer: “You are risking life and limb asking anyone to play out there.” The game went ahead regardless. Frank Branscombe, who is believed to have slipped on the ice, kicked Main in the stomach in a rather brutal tackle. Main was assisted off the field and although shaken did not take any further part in the game, but he had tea with the team after the match. His condition worsened during the night though, and the next morning he was rushed to hospital. With severe bruising and the imprint of Branscombe’s studs on his stomach, he underwent emergency surgery where it was discovered he had a ruptured bowel as a result of the collision! He failed to recover and tragically died four days after the incident. Fortunately these days, with advanced medical knowledge and modern technology, many shocking injuries that would have ended a footballer’s career twenty or so years ago, can now quickly and successfully be more thoroughly assessed and treated. Thus allowing players to recover fully and reach peak fitness again so they can play out the rest of their career. This guest post has been sourced, researched and written by Diane Povey who is contributing content for the road traffic accident claims and work accident claims specialist Claims National. Has The Modern Football Boot Increased The Number Of Injuries To Star Players? This entry was posted in Soccer and tagged accidents, Alf-Inge Håland, Aston Villa, Ben Collett, Bradford City, Charlton, Chelsea, David Busst, Dean Ashton, Dean Saunders, Denis Irwin, England National Football Team, football, football injuries, football tackles, Frank Branscombe, Gary Smith, Gordon Watson, injuries, Ipswich, James Main, Kevin Gray, Kevin Muscat, Leeds, Liverpool, Luc Nilis, manchester united, Matty Holmes, Middlesbrough, Paul Elliot, Peter Schmeichel, Richard Wright, Roy Keane, Shaun Wright-Phillips, Soccer, soccer blogs, soccer injuries, sports and leisure, Sports Archives, Sports Blogs, West Ham. Bookmark the permalink. 3 Responses to The Sports Archives – Nine Terrible Football (Soccer) Tackles That Ended Careers!